The Dakshineswar Temple is located near the Bally Bridge, on the banks of the River Ganga, Kolkata. In the Dakshineswar Temple, Goddess Kali is worshipped as Bhavatarini (the redeemer of the Universe). The great Sri Ramakrishna Paramhansa had attained enlightenment in the Dakshineswar Temple. Hence, the temple has a number of memories dedicated to both Sri Ramakrishna and Sarada Devi (Ramakrishna’s wife). In the early period of 1800s, the Dakshineswar Temple was just a small village on the eastern banks of the River Ganga and was surrounded by forests. The immense popularity of the Dakshineswar Temple is testified by the fact that almost 40,000 devotees visit the temple every day. The presiding deity of the Dakshineswar Temple is Goddess Kali or otherwise known as Bhavatarini. The main shrine in the Dakshineswar Temple complex, known as the Navaratna Temple, hosts the idol of Goddess Kali standing on the prostrate body of Lord Shiva atop a silver lotus with thousand petals. Besides this, 12 temples, surrounding the Navaratna Temple, are dedicated to Lord Shiva. Goddess Kali is also revered as Uma, Gauri, Parvati, Jagatmata, Durga, Chandi and Bhairavi. Later, a temple of Rani Rashmoni was built within the temple premises. Since the Dakshineshwar Temple was built in the year 1847, there is no such archaeological significance of the temple. However, regarding the worship of Goddess Kali it is pertinent to state that in the ancient Indian cities of Kalibangan, Mohenjodaro and Harappa, numerous idols and figurines of the Goddess were discovered, thereby testifying the fact that worship of Goddess Kali was very much prevalent during the period. 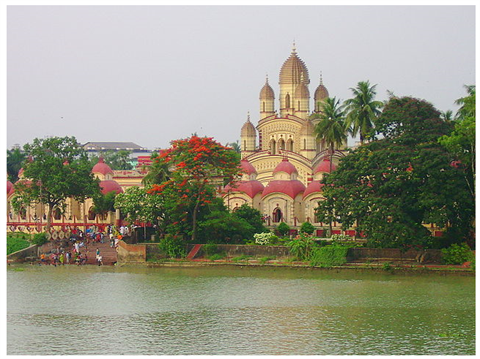 The Dakshineshwar Temple was established by Rani Rashmoni, as per her husband’s wishes. After the death of her husband, Rani Rashmoni set out on realizing her husband’s wishes and the effort was further accelerated after she had a dream. Rani Rashmoni had ordered for a land hunt to her youngest son-in-law, for the temple to be constructed. The plot on the banks of the River Ganga, in the Dakshineswar village, was finalized. The plot measured 54.4 Bighas and was valued at Rupees forty two thousand five hundred. The idols were installed by Ramkumar, the head priest of the temple, and were dedicated to the spiritual Guru of Rani Rashmoni. On the auspicious occasion of Snana Yatra day, more than a lakh Brahmins and renowned scholars were invited for the inauguration of the temple. After the death of Ramkumar, the responsibilities of the temple were handed over to his younger brother Ramakrishna, who later went on to become one of the most ardent devotees of Goddess Kali. Rani Rashmoni sold many of her properties and donated the same to the Dakshineswar Temple Trust. Rani Rashmoni died in the year 1861. As referred to in scriptures, the birth of Goddess Kali or Kalika took place upon the ardent prayers of the contemporary Gods and Goddesses, after they were defeated in the hands of the two Asura brothers, Shumbha and Nishumbha. Goddess Kali was created out of the body of Adyashakti, the source of primordial energy. Goddess Kali is the first of the ten Mahavidyas. She is also referred to as Kousiki and Mahakali. Goddess Durga’s triumph over the demon Mahishasura symbolizes the victory of the spiritual dimension of mankind over the baser worldly passions. When confronted with the demon King Mahishasura, the ten-handed Goddess Durga was created out of the stream lightning pouring forth from the mouths of Lord Brahma, Lord Vishnu and Lord Mahesh (Shiva). Goddess Durga was equipped with the best of weapons by the Holy Trinity. The Dakshineshwar Temple was founded by the tremendously reform minded Rani Rashmoni. She wanted the temple to be a pilgrimage site for people of all castes, creed and religion. The Dakshineshwar Temple was partially built upon a Muslim burial ground. The cultural significance of the temple is testified by the fact that some of the most eminent spiritual personalities of the nation were associated with the temple i.e. Ramakrishna Paramhansa, Swami Vivekananda, Sri Anandamayi Maa, Neem Karoli Baba, Swami Ramdas and Paramahansa Yogananda. The Dakshineshwar Temple was built in the Navaratna or the Nine Spires style of architecture that was very much prevalent in West Bengal. The temple complex is located on a highly raised platform and is situated on the banks of the River Ganga. The main temple is south facing and has three storeys. The Garbha Griha or the Sanctum Sanctorum of the temple hosts the Bhavatarini idol of Goddess Kali standing upon Lord Shiva. Both the statues are lofted upon a silver lotus with a thousand petals. The temple complex also consists of twelve Lord Shiva shrines, a shrine dedicated to Rani Rashmoni, a temple dedicated to Radha-Krishna and the Navahat Khana, situated on the northeastern fringes of the temple complex, where Ramakrishna Paramhansa had spent most of his time in the temple. The twelve shrines dedicated to Lord Shiva are identical is structure and are built in the Bengali ‘Aat Chala’ style of architecture. The Lord Shiva shrines are closer to the banks of the River Ganga and houses a Shiva Linga each. The Vishnu or the Radha Kanta temple, located on the northeastern fringes of the temple complex, houses a 21 and half inches idol of Lord Krishna and a 16 inches idol of Radha. This is the place where Sri Ramakrishna Paramhansa is believed to have spent a considerable part of his life. Here, Ramakrishna had offered the Phalharini Kali Puja to Sri Sarada Maa. Swami Vivekananda and Keshab Chandra Sen are some of the numerous ardent followers of Ramakrishna. The Navaratri festival, one of the most prominent festivals of the Dakshineswar Temple, is celebrated over a period of nine days and nights and is dedicated to Goddess Durga. Pre-pubescent girls or ‘Kanyas’ are worshipped as an embodiment of Goddess Durga. The Ayudhya Puja is celebrated on the ninth day of the festival and on this occasion tools of livelihood are offered to the Goddess to seek her blessings. The Dussehra is celebrated on the tenth day and the Saraswati Puja is also celebrated on the same day. Kali Puja, dedicated to Goddess Kali, is widely celebrated in the states of West Bengal, Orissa and Assam. The festival coincides with the Diwali festival, during which Goddess Lakshmi is worshipped throughout the country. Both tantric and brahmanical rituals are offered to Goddess Kali and the Kali Puja is very elaborately celebrated in the temples of Dakshineswar and Kalighat. Nearest Railway Station: Dakshineswar (suburban) & Howrah (Junction). Nearest Metro Station: Dum Dum.